The Staff Assembly of Newman University is happy to announce the 17th annual Silent Auction, to be held on Friday, April 21, 2017. The auction will take place in Mabee Dining Center from 11 a.m. to 1:45 p.m. There will be a door prize drawing every half hour beginning at 11:30 a.m. — (door prize drawing winners must be present to win). Proceeds will benefit Newman University’s Hearts and Hands Fund and Starkey, Inc. — a non-profit organization helping adults with developmental and intellectual disabilities live more independent and active lives. Starkey was founded in 1930 by Hattie Starkey, and was originally a school for children with disabilities. Starkey, Inc. is the oldest organization of its kind in Kansas serving more than 500 individuals. Their programs include independent and assisted living, work placement, day programs, transportation and case management. Starkey’s newest community living development, Keystone Place, will provide housing for 32 people who receive services from Starkey. The project is expected to open in late 2017. The silent auction is open to the public, and the support of any and all who would like to join in on the fun is most welcome. 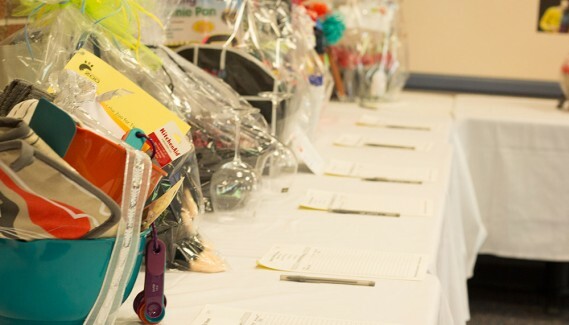 Past auctions have proven to be fun events visited by staff, faculty, students, friends, family, and even donors who help make the event possible.